What draws me to this performance is an image of an earlier work. The performer is wearing a white dress, standing at the corner of a room facing outward. 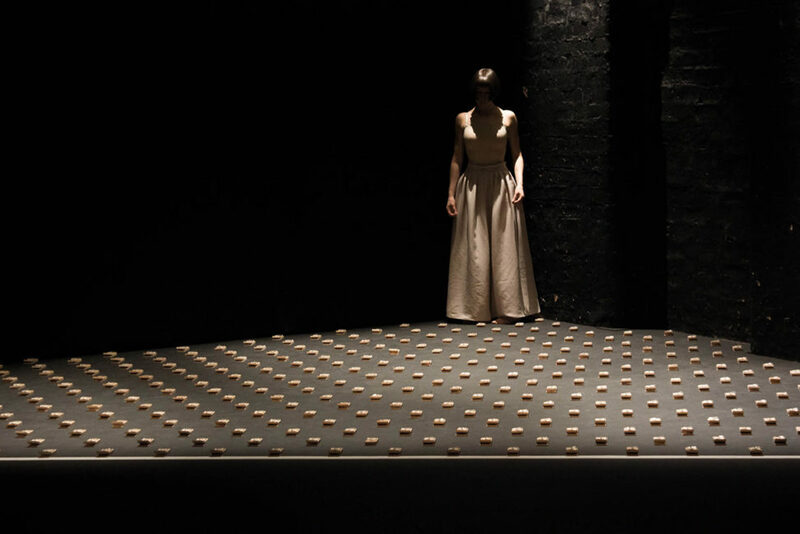 She is surrounded by many hundreds of small objects, meticulously arranged into rows on the black floor. The objects are mousetraps. The performer is barefoot. The photograph documents the completion of a durational performance, seven hours total, which I could not attend. And so, over the course of two years, I sometimes recall this image from Present Tense, by Adam York Gregory and Gillian Jane Lees, like an article of faith. My interest in contemporary performance concerns the emergence of new forms, or the recurrence of old forms, as resistant forces. Underlying the emergence of forms is the refinement of practices: ‘ways of doing and making’ which ‘intervene in the general distribution of ways of doing and making’ and in the ‘relationships they maintain to modes of being and forms of visibility’ (Rancière 2005: 13). As makers of durational performance, Lees and Gregory ‘intervene’ in or ‘redistribute’ temporality, revealing its effects, and affects. They insist upon certain conditions’ qualities, identifying and elaborating upon the distinction between abstract time and concrete duration. If one attends to their work as an image, it looks historical. The image they produce could as easily belong to the 1960s and 70s as to the present. It invokes a certain tradition, a formalism emerging from spatial practices, between minimalist sculpture and performance installation. In images, the dimension of space is revealed, just as the dimension of time is obscured. In the image, one sees rows and rows of objects. Use of these objects is symbolic, referential. In performance, this play of referents resists reduction to semiotic or phenomenological approaches. Nor is it reducible to a conceptual art. Lees and Gregory’s collaboration, sustained over three years, has produced three extended works: Constants and Variables (2015), Present Tense (2016) and Strike (2018). Each consists in a task, involving multiple identical objects which, when assembled or positioned, produce a spatial composition. In the first, Lees decants and fills small vials of ink wearing a dress of white paper. In the second, she corners herself with several hundred traps. In the third, she assembles forty electric lights, by matchlight. Each elaborates a procedure more than a concept: processes, objects, things multiply, in patterns of repetition which manifest substance, mass and density. Their performances produce tensions, a play of force and resistance: resistance in the spring of a trap, tension in the hand that sets it; or between the whiteness of the sheet, the blackness of the ink. In this tension there emerges a sense of risk. Risk, like resistance, may be primarily symbolic; neither resistance nor risk ought be dismissed as merely symbolic. The tensions are not simply either real or imagined. The work is care. Their performances first of all give form; form exists and contends, between the material and immaterial, the corporeal or incorporeal, the actual and the virtual. The greater tension is between time and space, between the actualities of present and the virtualities of past and future. Performance is always ‘an invitation to be here and now, to feel exactly what it is to be in this place at this time’ (Etchells 1999: 18). Yet our capacity to be present is delimited and circumscribed by all of the demands of our historical moment. Invitation to attend is twinned always with demand: a ‘struggle to produce witnesses rather than spectators’ which is ‘present everywhere in the contemporary performance scene’ (ibid.,18). We profess faith, in hope of bearing witness. Our faith in performance is sometimes placed in its ephemeral ontology, since ’Performance cannot be saved, recorded, documented, or otherwise participate in the circulation of representations‘ (ibid., 146) on the implicit understanding that: ‘once it does so, it becomes something other than performance’ (ibid., 146). Performance consists in material becoming. Any ontology of performance is an ontology of becoming. The sensation of becoming, and all the possibilities it may unfold, is intensified in the event of performance as though it is a discrete temporality. But this always emerges from within a fuller duration: from within the temporality of a practice. It is to the temporalities of Lees and Gregory’s practice that I want to attend. I can only do so at a significant degree of remove. Accepting that remove, and acknowledging the artists’ own articulation of their processes, I want to begin to consider the relationship between performance event and performance practice. This is in an attempt to understand the force that durational performance exerts, in both the immediate culture of performance and the wider culture of capital that would delimit it. To understand this force, and its potentials, requires some further reflection on the implications of Phelan’s ‘ephemeral ontology’. The inflection I would lend to this statement, significant as it is, seductive as it seems, is not that performance is essentially resistant to capital, but that it is potentially so, wherever the event of performance becomes a source of productive tensions and generative constraints. In Hannah Arendt’s avowedly humanist terms, the polis is a space of appearance — a place where people ‘exist not merely like other living or inanimate things’, but ‘make their appearance explicitly’ (Arendt 1998: 158-9). Yet this is adequate to a posthumanist conception of art, one fit to address the complexities of contemporary, coeval, existence. ’Wherever people gather together’, she continues, ‘it is potentially there, but only potentially, not necessarily and not forever’ (ibid., 158-9). Arendt describes the appearance of the polis as ‘unlike the work of our hands’ since it ‘does not survive the actuality of the moment which brought it into being, but disappears with our dispersal’, with the ‘suspension of the activities themselves’ (ibid., 158-9). Reading Phelan alongside Arendt helps draw out these potential — rather than essential — qualities of performance. The concept of an ephemeral ontology of performance demands that we think beyond an essential brevity, toward potential depth. If space is experienced as extensity, time is experienced as intensity. In order to consider durational performance in its potentials for force and resistance, some reflection on the distinction between abstract time and concrete duration is necessary. As John Berger writes: ‘The deeper the experience of a moment, the greater the accumulation of experience’ and so ‘the moment is lived as longer. The dissipation of the time flow is checked’ (Berger 1984: 35). And so what the philosopher Henri Bergson called la durée, or concrete duration — ‘is not a question of length but of depth or density’ (ibid., 35). The distinction Bergson makes is between time quantified, reduced to number, confused with space, extensity; and duration as the qualitative experience of time as it is lived and perceived. Berger can help us to see Bergson’s account of duration in political terms, although its implications may be understood, ultimately, as ecological or evolutionary. Yet as we continue to think of performance in political terms, we can refer to Nicholas Ridout’s response to Arendt, in the context of theatre studies. For Ridout, after Rancière, the theatre presupposes rather than produces ‘community’. Yet the theatre also makes the community it presupposes explicit. For Arendt, the polis is not the ‘city-state in its physical location’ but ‘the organization of the people as it arises out of acting and speaking together’ (Arendt 1958: 198), dependent upon a freedom from the demands of labour. Conversely, Ridout sees the communist potentials of the theatre as emerging between labour and leisure, each being modes of capitalist production. He describes theatre as ‘a good (because perverse) place to go looking for communist potential’ not ‘because it offers any kind of space beyond or outside capitalism, but precisely because it usually nestles so deeply inside it’ (Ridout 2015: 9). I push gently through two sets of fire curtains, to lean against the brick wall of a small room in Matthews Yard, Croydon. It is a site defined by its industrial heritage, and by creeping gentrification, or social cleansing. The festival, and the performers, and myself, are each entirely complicit in this context. It is dark, momentarily. There is little time for my eyes to adjust before the striking of a match. The matchlight illuminates everything in the room: performer, chair, desk, tray, water, and a system of extension sockets, together with forty lightbulbs, fittings, plugs, fuses, and several matchboxes. In the return to composition, geometric arrangement, the dimension of space is formalised – yet the dimension of time is deformalised. The units of space are a ground, a territory. In this territory the force of time is no longer accelerative. It is in this gesture that resistance begins. As Zygmunt Bauman writes, modernity was ‘born under the stars of acceleration and land conquest, and these stars form a constellation which contains all the information about its character, conduct and fate’ (Bauman 2000, 112). Throughout modernity, time becomes an ‘instrument’ — a ‘weapon’ in the conquest of space (ibid., 112). Ecologist Krista Lynes observes: ‘The world has been forcefully sculpted in the last several centuries by the twin projects of colonialism and capitalism’ (2016, n.p.). This ‘expropriation’ and ‘dispossession’ is not simply a ‘remote imperial history, but an ongoing and everyday process’ (ibid., n.p. ): one that is explicitly a result of acceleration and instantaneity. Correspondingly, art critic Terry Smith notes: ‘with the world situation seeming to spin into a state of unfathomable decomposition, when art today seems as diverse as to defy coherent categorization, in what sense, or senses, might we speak of a contemporary composition?’ (Smith 2016: 20). From the fire curtains to the sulphur of the matches to the filament of the bulbs, heat and light are palpable forces in Lees and Gregory’s Strike. The wiring of forty lightbulbs over four hours by the light of 152 matches is a relatively low output of energy compared to an hour spent under theatre lights. The small room in Matthews Yard remains relatively cool against the heat of the day. Over four hours we pass the threshold of the sunset. Night falls at the beginning of the final hour of the performance, when the lights come briefly, brightly, up. There is a collective gasp from the fifteen or so people who have assembled to mark the completion of the task. I stay a few minutes, pushing my back against the wall, in a brightness as total as the darkness in which the performance began. The light and darkness are entirely contrived. The performance is an interval between a day of restlessness and a night of pensive speculation. The affect of the performance is borne out of light, dark, heat, coolness, in the hundreds of manual gestures, in which tending and holding— contrivances all — bind life and care together. In such moments, one goes back to a certain beginning. Berger writes: ‘Many previous cosmological explanations of the world proposed’ both an ‘ideal original state and, afterwards, for man, a continually deteriorating state’ (Berger 2001: 485). So does the theory of entropy (ibid., 485). Against this, ‘what is ahistorical is the need to hope’ (ibid., 487). One must have a place to hope from. For this reason, perhaps, Smith refers to ‘Place making, world-picturing and connectivity’ as the most common concerns of contemporary artists (Smith 2016: 21). All art is a search for a place, and from place, a time. ‘In the beginning is chaos’ writes Elizabeth Grosz, not ‘absolute disorder’ but ‘a plethora of orders, forms, wills – forces’ (Grosz 2008: 5). Following Deleuze, she argues that art ‘does not produce concepts, though it does address problems and provocations’); rather it produces ‘sensations, affects, intensities’ as ‘its mode of addressing problems’ (ibid., 1). Art establishes ‘networks, fields, territories that temporarily and provisionally slow down chaos’, to extract something ‘not so much useful as intensifying’ (ibid., 2, my emphasis). Toward the intensification of sensation, she argues: ’The first gesture of art is the fabrication of the frame’ (ibid., 10). In the image from one performance, which draws me to another, I recognise a plane of composition, in the ordering, the patterning which recurs across different iterations of Lees and Gregory’s practice. A sense of order and compositional unity emerges which has much in common with minimalist sculpture. This connotation of clear lines and regulated space feels tense in fact, out of character with the rest of the festival and much of the wider culture of performance. If there is a plane of composition in contemporary performance it is identity, or the body itself, its ways of being, becomings, transformations. Thus the performance activates a tension fundamental to art itself. In refining a practice in spatial composition, Lees and Gregory begin not with the ‘exteriorization of one’s own bodily forces and energies, the transformation of flesh and blood into canvas and oil’ but with a ‘more primary gesture that requires a body’s prior separation from the earth, from nature, from its world’ (Grosz, 10). The implication of this ‘more primary’ gesture is that art becomes an ‘extension of the architectural imperative to organize the space of the earth’ (ibid., 11). Art is fundamentally an ecological practice, related to dwelling, habitation. A further implication is that art is grounded in perception and movement, in sensing and feeling, in the relationship between matter and thought, between the actualities of the material conditions of living form and the virtualities of memory and imagination. Grosz sees art as rooted ‘not in the creativity of mankind but rather in a superfluousness of nature’ (ibid., 11). Art is evolutionary because it is abundance, proliferation, superfluity, rooted in the ‘natural and in the animal, in the most primitive and sexualized of evolutionary residues’ (ibid., 10) and thus ‘continually haunted by the animal’ (Deleuze and Guattari 1994: 184). In recognising art as a force of nature — a force in nature — we move beyond Arendt’s conception of the Space of Appearance, beyond its humanist focus (and human exceptionalism). If, through art, we make our appearance, it serves to explicate that we appear not unlike other living or inanimate things. If a concept can be derived from art, it is from implications of specific artistic practices, from material becomings, as modes of evolutionary becoming. Not a sublimation of sexuality but twinned impulse, art reaching beyond the necessity of survival (and the reproductive logics of normative heterosexuality or capitalism). When I look at the arrangement of the vials, or traps, or light fittings, I see a return to composition that feels almost conservative in its recovery of the artistic gestures of the twentieth century. It is only in the passing glance afforded by a single image viewed on social media that I draw this connection. And yet this connection draws me into the present of a new work, into all of the tensions present within it. The argument is still with modernity, with modernism. The question remaining to us is of how we might live in our own time. In its privilege of formalism one sees in minimalist sculpture a refinement of the geometrical approach to the ‘public space’ of the modern city. As Tim Ingold observes, ‘in one of the founding statements of architectural modernism’ Le Corbusier declared: ‘Man walks in a straight line because he has a goal and knows where he is going; he has made up his mind to reach some particular place and he goes straight to it’ (Le Corbusier 1947: 11). And so: ‘The line becomes a virtual icon of modernity, an index of the triumphs of rational, purposeful design (Ingold 2007: n.p.). What we see on a large scale in the appearance of the polis, from Georges-Eugène Hausmann’s restructure of Paris in the 1850s (Harvey 2003: 102) to the construction of the Brooklyn Expressway a century later (Berman 1982: 290-1), is the imposition of geometric order upon social life. Its corollary in art is minimalist sculpture. Smith argues that contemporary art ‘instinctively recurs to earlier styles of art history, particularly modernist, postmodernist, and late modernist formats and imagery’ (Smith 2016: 25). Just such a return, to the clearly ordered lines of minimalism, creates the most palpable tension in Lees and Gregory’s practice. But it is against ‘unfathomable decomposition’ (Smith 2016: 20) that Lees and Gregory reassert a compositional sensibility. In the many vials of ink, the springs of traps, the filament of bulbs, and in the near neat arrangement of these objects in rows, the clear lines of modernity become a spectral presence. For we sense that in ‘nature’ lines are rarely, if ever, straight (Ingold, 2007: n.p. ), that: ’Form is the end, death. Form-giving is life’ (Klee 1973: 269). What emerges, in the time of performance, and through the temporality of practice, is a sense of life, as force, in perpetuity. The immediate tension is against a culture of capital which has abandoned its own claim ‘to be a culture and becomes nothing more than an instant practice’ (Berger 2001: 485). The time of the present, digital time, is but ‘a single column of ones and zeroes. A vertical time with nothing surrounding it, except absence’ (Berger 2008: 119). If this sense of verticality describes our contemporary moment, it describes a cultural context in which temporality is understood only through the narrative of entropic decline: ‘The concept of entropy is the figure of Death translated into scientific principle’ [Berger 2001: 485]. To ‘question the finality of the principle of entropy is not to dispute the second law of thermodynamics’. And yet: ‘It is their finality which needs to be disputed’ (ibid., 485) – necessarily so, since the need to hope is ahistorical (ibid., 487). ‘Within a single present, within digital time, no whereabouts can be found or established’ (Berger 2008: 119). Lees and Gregory search for a whereabouts in the essentially abstract gesture of art. From within an abstraction of space in the labour of composition, a concrete duration unfolds, focussing the eye, attuning the ear. We can trust our senses again. In philosophical terms, the performance enacts a tension between time understood quantitatively and duration experienced qualitatively (after Bergson 1910). Inner duration, as we perceive it, ‘is nothing else but the melting of states of consciousness into one another’ (ibid., 107). These states are in response to the intensities of sensation provoked by the flickering, guttering light, the turn of a screw, the flick of a switch, shades of darkness, the smell of phosphorus, expulsions of breath as the performer extinguishes a match, in winces of pain, or murmurs, as the whole of this activity produces its distinct rhythm and refrain. George Home Cook writes that there is ‘a collective, as well as an individual, sense of commitment, discipline and responsibility engendered by the act of attending theatre’, in which ‘we are necessarily required to make an effort, to do something, to stretch ourselves’ (Home Cook 2015: 1). If, attending theatre, or performance, something of the wonder of the world unfolds, it is because we actively seek it. As Jon Foley Sherman considers: ‘Wonder does not suppose a comfortable place in which to recline and take in the view … On the contrary it demands and unmoors’ (Foley Sherman 2016: xii). What I hope for, in travelling to Croydon on a hot summer’s evening, is that the act of faith will be borne out in the effort of attention. Months earlier, as I glance at an image, I know that the artists know this: ‘What makes durational work powerful is that is requires discipline from the performer and the audience. It always takes time, it is slow. And slowness isn’t fashionable’ (Lees and Gregory 2018: n.p.). In considering wonder, Foley Sherman continues to argue: ‘To suggest preference for this kind of encounter … amounts to making an ethical claim’ (ibid., xii). Placing one’s faith in certain practices is a critical position. To bear this faith out we must make explicit the ethical claims implicit within certain practices. It does no good to insist that the event of performance is inherently resistant to capital: current economic models for performance may render it little more than affective labour, an aesthetic manifestation of ‘instant practice’. Not dismissing its symbolic potentials for resistance, we can also seek out its material foundations, as ‘the embodied action of cultural forces’ (McKenzie 2001: 8) or ‘culture’s most direct mode of enhancement or intensification of bodies’ (Grosz 2008: 23). I am less concerned to assess the quality of the performance, than to attest to the qualities inherent in the practice from which it is derived. In common with much contemporary performance, Lees and Gregory’s practice involves a degree of retrospection. Yet in its concern with spatial composition it feels entirely distinct from those modes of performance beginning from the body and identity, which serve an identitarian politics. Against this, the ‘place-making’ identified by Smith as early as 2010, which defines Lees and Gregory’s practice, seems almost conservative. It is an art which is, precisely, conserving, economical, modest of means. Cultural, social, and political life is defined by a sense of urgency, in the acknowledgement of ecological crisis, and narratives of entropic decline. If durational performance has any political efficacy, or any ecological or evolutionary potential, it emerges, perhaps, through deceleration. Deceleration may be fundamental to an artistic process in which ‘living bodies, by no means exclusively human, create networks, fields, territories that temporarily and provisionally slow down chaos’ (Grosz 2008: 3, my emphasis). The intensification of sensation, rather than necessitating speed, may demand slowness. No faith, nor hope, no future worth the name can be conceived in an instant. Throughout, Lees is at her task, not confronting it (Merleau-Ponty 1962: 416). The immediacy of the performance itself is the small refrain. The larger refrain is the practice. Performance, like life, is made up of tasks: ‘the task has a beginning and an ending. Every ending, however, is potentially a new beginning, marking not a terminus but a pause for rest in an otherwise continuous journey’ (Ingold 2011: 59). Between the smaller and the larger refrain, Lees cannot ‘stand aside and observe the passage of time’ that is ‘founded upon an illusion of disembodiment’ (Ingold 2000: 196). Nor can I.
Deceleration, arguably, is the foundation for any conception of efficacy of either art in general or performance in particular. If Lees and Gregory’s practice seems in tense relation to other artistic practices currently perceived as radical, it is because they consciously, deliberately activate tensions between forms of gratification. To recognise their compositional logic is not merely to identify the root of the problem they are attempting to address. The artists themselves say: ‘any action that creates order, or resists change, causes an increase in tension’ (Lees & Gregory 2018: n.p.). In this tension, the possibility of a contemporary composition emerges. In performance: ‘The commonplace appears transfigured and becomes conspicuous’ (Fischer-Lichte 2008: 166). There is no more common place than one’s own body, nothing more conspicuous than one’s own consciousness. We seek, in (attention to) artistic practice, the restoration of sense and feeling. The promise of art, the hope that it permits, the faith that it answers, is that the time of the body and the time of consciousness can be realigned: ’the passage of one present to the next is not a thing which I conceive, nor do I see it as an onlooker, I effect it’ (Merleau-Ponty 1962: 421). Time under capital is indifferent as money (Berger 2008: 118). Time is perceived between the actual and virtual, between present and past and future, where memory and imagination become affective states which, implicitly, bear hope. Lees and Gregory’s practice emerges in the tensions of forbearance, in the making of place. Their performance slowly readmits the dimension of time, and thereby establishes a whereabouts: ‘Thus the present is not marked off from a past that it has replaced or a future that will, in turn, replace it; it rather gathers the past and future into itself, like refractions’ (Ingold 2000: 196). Next how to organise your writing archive?